Several years ago, in conjunction with the Mogan Cultural Center, I created an exhibit titled “Browsing Through Birke’s” about my parents’ story as Holocaust survivors and their store in downtown Lowell; Birke’s Department Store. During this time, I also helped produce a documentary of the same name. A few months ago, the Lowell Film Collaborative premiered the film Browsing Through Birke’s, a poignant yet humorous film about my parents who survived the Holocaust, their perseverance, and success in the landmark clothing store they ran for 50 years. My dad was like the Soup Nazi on Seinfeld –only about clothing. 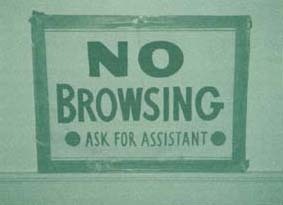 He posted a giant NO BROWSING sign, the first thing customers saw when they entered. Think of the first Marshall’s, but with a Goodwill décor and Lenny Bruce for an owner, yet with a wife who was sweet and friendly, –and who fed you cookies while you shopped! Since the premiere, many people have purchased the DVD, and I have received lots of emails from people telling their stories of shopping (or not being able to get in to shop) at Birke’s. Also please visit www.BrowsingThroughBirkes.com for more on their story, historical documents, photos and more. I would love to hear from you: Please leave a comment or email me at Szifra@BirkeConsulting.com with any stories or personal experiences you had at Birke’s.